Kolchak: The Night Stalker is an American television series dealing with the themes of the supernatural, monsters, aliens and strange happenings. The television show was created after a movie called "The Night Stalker" was a big ratings hit. Kolchak: The Night Stalker stars Darren McGavin as a reporter named Carl Kolchak whose job is to investigate reports of unusual occurrences. Kolchak is supposed to determine if something supernatural is really occurring or if the occurrence is a hoax. A typical episode in the series is the episode called "The Ripper." In this episode, there is a report of a serial killer committing murders in the same manner as Jack the Ripper of London many years ago. Kolchak investigates to see if Jack the Ripper has come back from beyond the grave. Other episodes in the series deal with vampires, flying saucers and ghosts. There are twenty episodes in the series that each run for an hour. Two feature length movies were produced based on the series. A prehistoric lizard is on the loose in a labyrinth of caves and tunnels under a research facility when its eggs, thought to be rocks, are taken for study. Kolchak believes the owner of a computer dating service is sacrificing her clients to achieve eternal youth when four of their bodies turn up as the corpses of elderly people. Carl Kolchak is the Knight Stalker, as a haunted suit of armor goes on a killing spree when there are plans to turn the museum that houses it into a disco. While investigating the deaths of four men whose hearts have been cut out of their chests, Kolchak uncovers ties to an Aztec cult and a 500 year old mummy in the basement of a hotel. A college professor unknowingly unleashes a succubus, a demon that takes female form, on the male students of Illinois State Tech. Kolchak teams with a reporter from the campus newspaper to find away to destroy the creature before it kills again. A headless biker from the 50's returns from the grave to exact his revenge on those responsible for his grisly death. Fashion models and snitches are being murdered and the only link is Madame Trevi and her salon. When Carl starts to poke around, he finds evidence that witchcraft may be involved. Carl stumbles into an oil company cover-up involving a murdered research scientist and what may be a creature revived from the ice age. Episode 12 - Mr. R.I.N.G. A hush-hush government project tries to keep Kolchak from reporting a story of a self-aware android who is killing those who would try to shut him down. Elderly residents of Roosevelt Heights are being killed by a creature that appears as the person they trust the most. A series of deaths during the construction of a hospital on sacred Indian land leads Kolchak to team with a Native American shaman to stop a vengeful bear god. A slimy green substance, identified as swamp moss, seems to connect a series of deaths to the legend of a Cajun bogeyman. The police have ruled the deaths of several of Chicago's upper class as suicides, but Carl believes they were murdered by a Native American shape-shifter. While being hounded by a devilish dog with a Satanic medallion on its collar, Kolchak tries to piece together the puzzle of a series of mysterious deaths surrounding a young politician. Several members of the Great Lakes Symphony are seeing a mysterious doppelganger of the conductor, Ryder Bond, and then apparently dying from "spontaneous combustion". Kolchak convinces Tony to send him to Los Angeles to cover a story about a transcendental meditation guru, but he's using the trip as a cover so he can investigate a series of murders in which the victims have been completely drained of their blood. Animals missing from the zoo, lead ingots, stereo parts and electrical equipment stolen by invisible thieves, and a strange black substance found at the location of each incident lead Kolchak to one conclusion, a UFO. Someone is using a twice dead Haitian named Francois Edmunds to put a hurt on the mob, but Kolchak's the only one who believes the man is a zombie. After four young women are murdered, Kolchak sees some eerie coincidences to the Whitechapel killings of 1888 and must race to find and save the fifth victim from "Jack the Ripper". 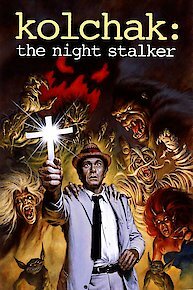 Kolchak: The Night Stalker is currently available to watch and stream on ABC. You can also buy, rent Kolchak: The Night Stalker on demand at Amazon, iTunes online.